It’s link party time again! Hooray!! 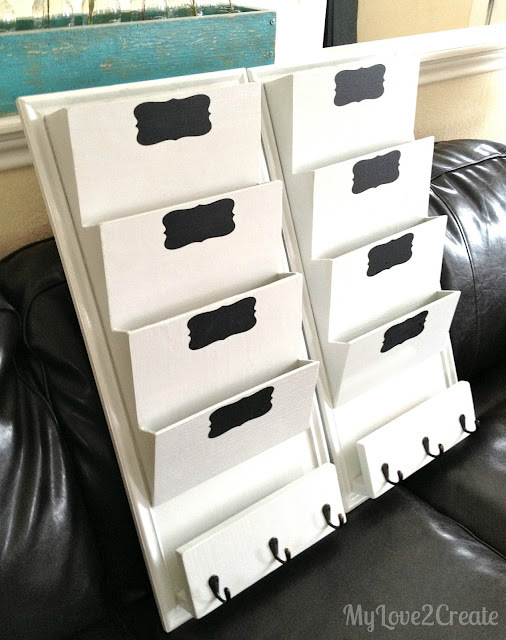 My Love 2 Create made these awesome family file systems and they are super cool. I love boxwood wreaths but they are pricy so I don’t have any. Now I can make one thanks to My House and Home‘s easy tutorial! Silo Hill Farm wins for coolest DIY project in the history of ever. If you are a Downton Abbey fan then you will go goo-goo ga-ga over this servants bell tutorial. I am really digging this awesome kitchen makeover from The Backyard Bungalow. Turtles & Tails redid some side tables and holy cow, if you go check out the before pictures, this after picture will be even more amazing. Great makeover. Practically Functional made a purse organizer from a hot pad. This is an excellent idea. Click through to check out the other pictures so you can get a real feel for how cool this little kit is. made her own Lucky sign. Isn’t is fun!? Want to jazz up a boring bowl? Take a cue from The Learner Observer and paint metallic polkadots on it. I’m quickly falling in love with Nalle’s House. Check out this awesome art. Looks expensive? Nope. It’s wrapping paper. Mind blown. Lurve. 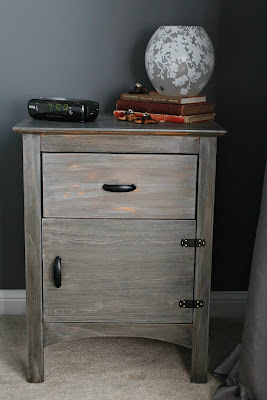 Growing in Grace wanted a kitchen island, so she made one from a kitchen cabinet. I’m very impressed! It even rolls. If you know me at all, you know I LOVE Peeps. Most of my friends and family gag that I even eat them, but I just can’t help myself. They are yummy! 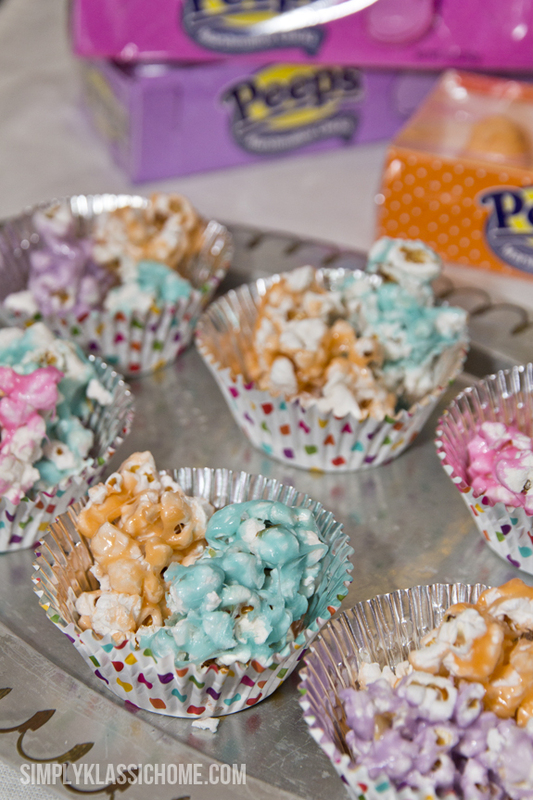 I am totally making this Peeps Popcorn from Simply Klassic. What could be better than Peeps flavored popcorn? Um, nothing. 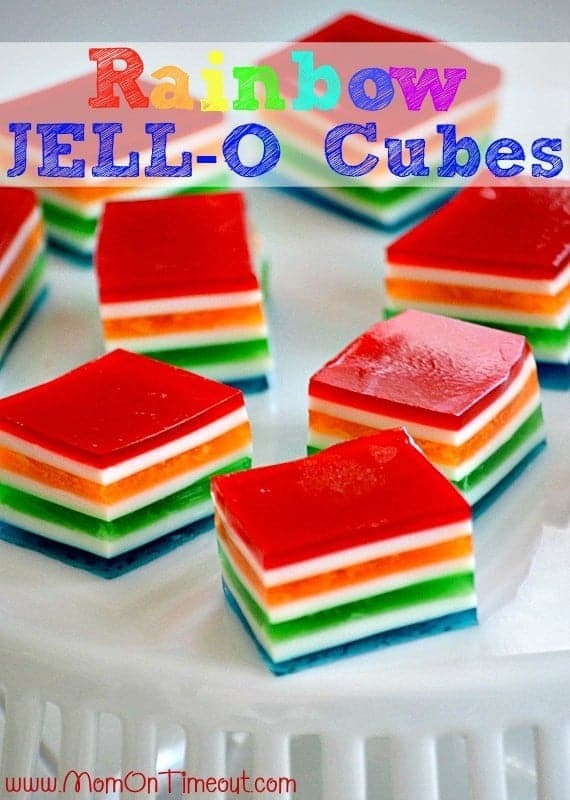 These rainbow cubes are so stinkin’ adorable. I could stare at them all day. Mom On Timeout shows how to make them, and they seem easier to make than they look. Unforch for us, my son can’t eat red dye, so jello is out, but they are so supeh cute anyway. Love the link up parties!! I love seeing your highlighted ones as I don’t always have time to go through the links! Quick question: don’t peeps have gluten in them? Maybe I’m mixed up- are you gluten free? We are just learning the diet as my two year old has been diagnosed with celiacs. Just curious! Thanks so much for hosting Allison! I love all of the features this week! Awesome features! Thanks for hosting, Allison! Thank you for hosting, Allison! Love that wrapping paper art feature! Great choice! Allison, thanks for another great party this week! It’s always fun!! Thank you so much for hosting this great party. I am new to this world and back for my second week! Excited to see what everyone posts week after week. Thank you so much for hosting! Have a fabulous day! Thanks for the party! Hope your week has been great so far! That peeps popcorn looks sooo yummy 🙂 Have you seen the hearts at Valentine’s Day? They are vanilla creme and they are SUPER yummy. I can only buy one though. I like them too much 😉 Thanks for hosting! Love that kitchen reno! Thank you so much for hosting this party!! Allison, thanks so much for featuring my little hot pad purse organizer! I’m so glad you liked it! And thanks for hosting this fab party too! Thanks so much for hosting a great party! Thanks also for including my wrapping paper art amongst the other lovely projects. Enjoy the rest of your week! Hi, Allison! This is my first time linking up at HoH, and I’m so glad I found your sweet blog. Thank you so much for hosting! Happy Wednesday! 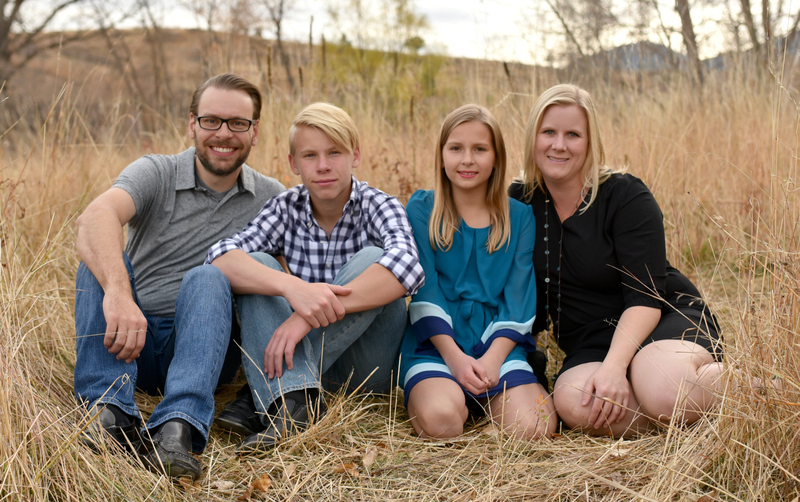 Thank you SO much for featuring my family file system! Have a wonderful week! Thanks for the great party Allison!! 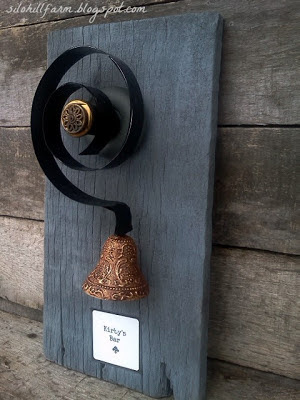 Thank you so much for featuring my Downton Abbey Bell and for saying such awesome things about it! It was a fun project to make and I am honored to be featured along with such other wonderful projects! You’ve always got the best features! Thanks for the party!! Wow, I’m thrilled to be in such good company! Thanks for the feature and for hosting week after week! There are hours of fun here! Thank you for hosting. It’s been a while since I participated in your link party, and oh my it has gotten huge. Also, I just pinned the crap out of a bunch of your tutorials. We just bought a house in Dallas and are trying to DIY everything. Thanks for all the great inspiration. Thanks for helping and congratulations for getting out of debt! Thanks sooo much for the feature Allison!!! So funny, people either love Peeps, or hate them – I’m on the LOVE side!! Thank you so much for your hard work in putting together these parties! Thank you for a great website and blog! (I’m sorry I linked in the wrong spot! I just linked up with you for the first time. I shared my fireplace renovation with you today. I am absolutely loving your blog and cannot wait to read over it for the next several HOURS! Thanks for hosting this great linky party! I have been a long time follower, but have been out of the blogging game for about a year. I am so glad to be back in action. I linked up to my first post in over a year, Dip-dyed ombre shoes. It’s a super easy and quick, fun project that I am happy to share. I have been inspired to come back to blogging by all those blogs I love to read and yours is one of them. Thanks again for hosting, have a great day! Thank you for letting me join your lovely linky party. I shared my Kcup bunnies! Now to browse these awesome links! Thank you for hosting this awesome party. Have a great weekend. Thank you so much for hosting!! Love the awesome features. Happy Friday! Thanks so much for featuring my Lucky Sign! I am glad you liked it Thanks for hosting! New link-er!! Thanks for hosting and the opportunity!! Can’t wait to start diving into all these awesome blogs!!! Follower for life here! !